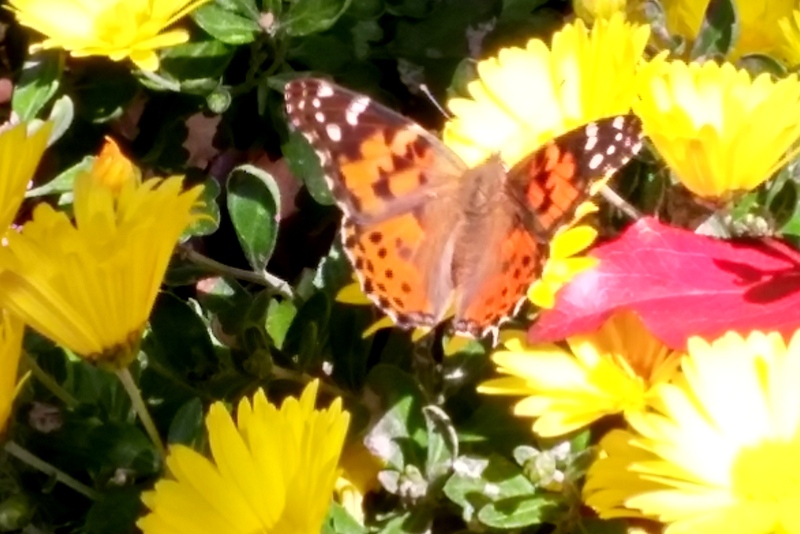 It is November 5th and I saw a butterfly. It is sunny today in Cleveland, Ohio, but cool. The temperature has not yet reached 60 and there is a breeze. Golden leaves are falling like rain. Could have I been mistaken, I thought, when I saw the fluttering from my kitchen window? I pulled back the vertical blinds from the patio doors so that cell phone and I could waste no time in checking out the back yard. A squirrel scampered away as we headed out. I didn’t see anything. I was pretty sure it was a butterfly I had seen land in the grass and not just a leaf as leaves are not white. And sure enough, no sooner had I spoken these words when the little cabbage white took to its wings again. I greeted it, of course, and asked if I might receive its image. It flirted with me, however, touching on my pink cosmos bloom for just a second before flitting into the air again. And I could hardly argue with that. Who am I to know what tasks this little one may still have had to complete in its short lifespan? I am not a butterfly and do not know their ways. Naturally I would like to think that it came only to deliver its message to me. But, more than likely, it had other assignments as well. Did it have a message for me? Well, it is November 5th. How often do we see butterflies in Cleveland in November? November 5th is my father’s birthday. Had he lived on, he would have been 87 today. Is it mere coincidence that in this year when butterflies were scarce that my garden had record numbers during that week in June between my parents’ wedding anniversary and the anniversary of my father’s death? Is it mere coincidence that, even though we have had many unseasonably warm days this fall, only today did I see a butterfly? That I happened to be looking out of my window while gathering towels for the laundry when it appeared? Yes, it could all be coincidence. But what is coincidence, if not the coinciding of the life we see and understand with the life that is still so completely and marvelously beyond our comprehension? In our humanness, we cannot help but look upon death with sorrow. No matter how strong our faith, it is a mystery and a parting that leaves us with a deep longing within. But we are not left alone in our sorrow. When we keep our hearts full of love, they become able to perceive the multitude of little gifts constantly being showered upon us, reassuring us that this sorrow is but for a moment. Everything is all right. All is most well in the eternal Love. And soon enough, we will experience this Truth in its fullness. This entry was posted in Uncategorized on November 5, 2016 by mary. Thank you for sharing this, Mary. It is such a beautiful thought. Thank you both. I am so blessed. world beyond words, don’t we, Mary. This is so nice. Im going to share with friends. Yes, indeed. I like to take the word “coincidence” back to “coincide”. Things “occur at the same time” without any apparent causal connection between them. But what is it that is occurring at the same time? A butterfly in my back yard. Me gathering towels for the laundry and glancing out the window. My father’s birthday. This is the portion of reality that we observe, the things that we are AWARE OF occurring simultaneously. Yet, for those of us who believe (and even for those who are unsure), we do not have to strain to consider that there is a great deal of reality about which we know nothing. Occurring here in time, many things happen that we do not observe or understand. Of the eternal realm, we know virtually nothing. Hence, there may – and most likely are – many, many things occurring in oneness (I won’t say “time” for the eternal has no time) and we can only watch with wonder and awe. What does it mean? What DOES it mean? Something glorious, no doubt. In my blindness, that much I can see. Something glorious. thinking this way all along–from . . .
from, but that same Oneness) . . .